The new offices will re-open to the public on Monday, April 1 at 8 a.m. The Diocese of Tucson offices temporarily closed Tuesday for a week, to move to a new location. 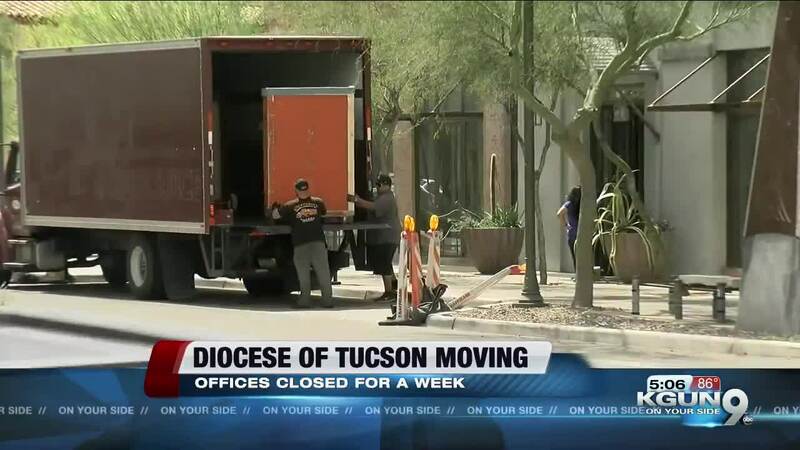 TUCSON, Ariz. — The Diocese of Tucson offices temporarily closed Tuesday for a week, to move to a new location. The center, at 64 East Broadway closed to allow movers and employees to move furniture and other equipment into the new offices at 192 South Stone Avenue, Building #2. The new offices are directly north and next door to St. Augustine Cathedral. The building will also be home for St. Augustine Cathedral Parish and the Cathedral Square Conference and Education Center. Because of the move, Pastoral Center email and telephone may be out of service and diocesan staff may not be able to respond to requests for a couple of days. The closure does not affect parishes or school operations. All phone numbers and emails will be the same as before the move.